Nearly every factory machine and sensor sends out huge amounts of structured and unstructured data across the global enterprise – but is the information providing actionable business insight? Can you gather actionable intelligence from your factory automation systems? Smart manufacturers can, with an intuitive web interface providing secure, anywhere access. More data, or more intelligent use of data? Today’s manufacturer contends with a flood of operational and shop floor data flowing from connected machines and systems. Companies seeking a competitive advantage gain value when they harness this data into actionable insight for better decision making, and improved operations. An advanced manufacturing analytics platform helps inform strategic planning, guides real-time operations and uncovers root causes of issues before they become bigger problems. This timely paper provides five best practices for a clear and simple path to unlocking the insight and value in a company’s “big data” store of operational transactions. 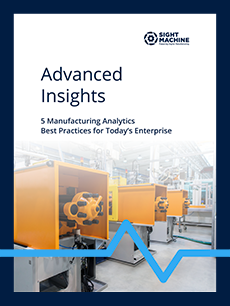 When used effectively, an advanced manufacturing analytics platform helps collect and analyze meaningful manufacturing data, provides a way to visualize the data in context, and give access to the right people at the right time.